Can you hear it? The millions of hooves pounding across the banks of the Mara River, the sounds of frantic splashing as wildebeests and zebra risk their lives to cross the crocodile filled waters. The adrenaline is palpable, and it belongs on everyone’s bucket list. The East Africa Great Migration is the largest land mammal migration on the planet. The journey is treacherous and takes place year round, culminating in the crossing of the Mara River between June and October of every year. 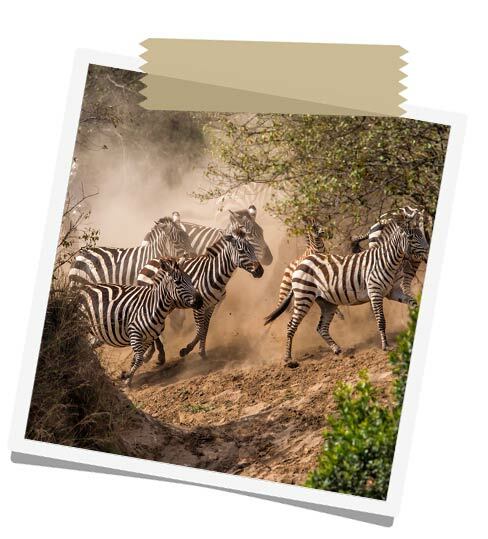 An African Great Migration tour is the best way to experience the thrill of witnessing this beautiful natural phenomenon. The experience is emotional, raw, heart-stopping, beautiful, and most of all, unforgettable. Contact us today to begin your journey to witness this incredible event. Experience the thrill of a lifetime on this five night safari in the Masai Mara. Spend the first two days exploring the Mara on daily game drives, followed by two days of witnessing the Great Migration river crossings of thousands of wildebeests, zebra, and more! Combine a thrilling migration safari with a one-of-a-kind cultural experience with the Hadzabe Bushmen and Datonga tribes. Later, float across the sky and witness the migration from above on an hour-long hot air balloon ride. Finish off the tour by experiencing the picturesque river crossing at the most northern point in the Serengeti savannah. 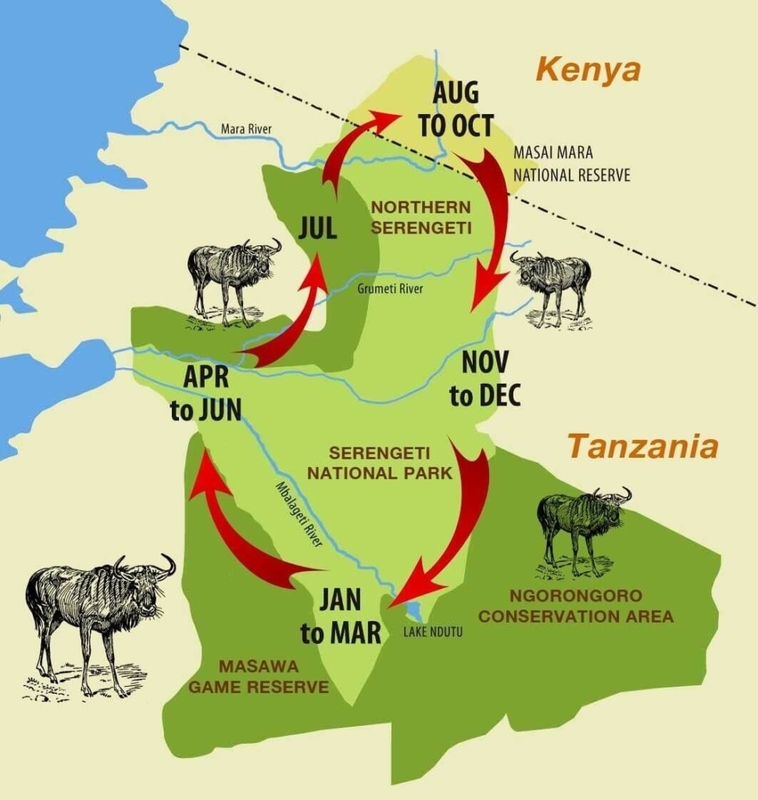 The Wildebeest Migration between Tanzania and Kenya is not continuously forward motion. They move to and from North/South and to the East and West, they mill around, they split up, they join forces again, they walk in a line, they spread out, or they hang around together. We can never predict with absolute certainty where they will be; the best we can do is suggest likely timing based on last year’s data. The migration is driven entirely by standing water, grazing, and local weather conditions and the wildebeest preferred location is the short grass plains of Southern Serengeti but the water and grazing in this location cannot support them year around. This is where they choose to give birth to their young (usually February to March), with the rich grass to support them. Within a relatively short space of time, perhaps 4 to 6 weeks, several hundred thousand calves are born. Between July and October is when we typically see the crossings of the Mara River. We track the migrations of the herd every year so we are able to best predict when the river crossing will occur in order to plan accordingly. Have Questions? We are here to answer any questions you might have about how to experience the Great Migration. Contact Us today or Follow Us on Facebook to keep up with our Great Migration updates throughout the year.